I can’t remember who I stole that line from, but it’s a pretty neat summary of how these machines work. They’re terrifically inefficient, taking twenty to thirty minutes of constant attention and an annoying amount of cardio to produce ice cream. The ice cream that comes out is rich, creamy, delicious, and exactly the same as the stuff that you can make with an electric crank. Seriously. The cream doesn’t care who turns the crank. This means that if all you care about is making ice cream, you definitely want to avoid a manual ice cream maker. With that said, working for something makes it taste a lot sweeter. Whether it’s because you were anticipating the taste of your homemade ice cream while you were cranking, because the hard work makes your brain value the ice cream more, or because of some other mental placebo effect, I can say quite confidently that you’ll think that the ice cream you churn yourself is some of the best stuff you’ve ever head. It might not hold up in a blind taste test with an identical recipe churned with an electric crank, but you’ll definitely enjoy the hand cranked stuff more. 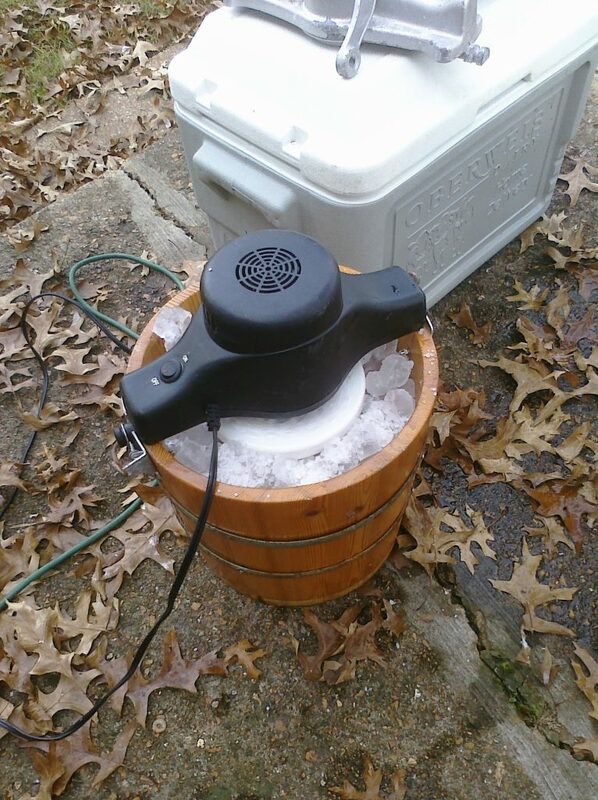 Because of this, having an old fashioned hand crank ice cream maker in your kitchen can be pretty neat. It’s a great way to get the family together to teach your kids the basics of following a recipe before persuading them to crank you several quarts of homemade goodness. They’ll remember the nights they spend churning hand cranked ice cream for the rest of their lives. 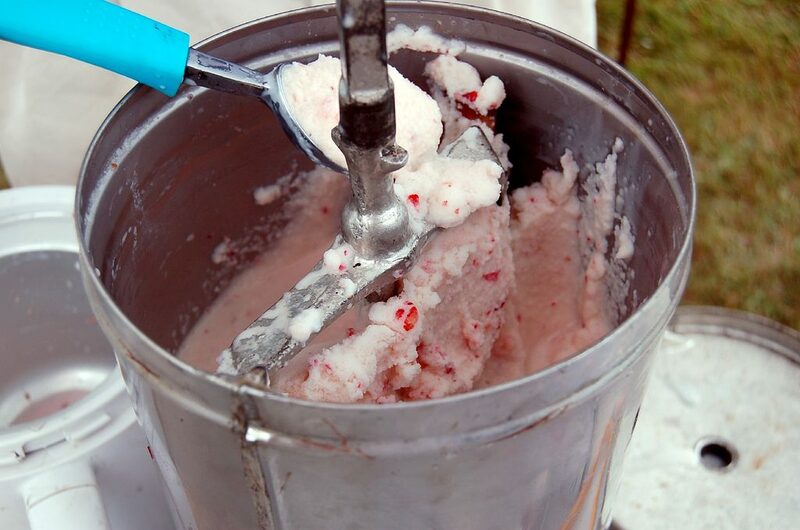 A high quality hand churned ice cream maker will set you back quite a few dollars. If you’re not sure that one of these big devices will fit into your kitchen, I suggest starting off with the Norpro 6840 instead. It’s a 1 pint ice cream machine that can easily fit on a tabletop. While you can’t make enough ice cream to freeze for later, this small device can still produce enough ice cream for you and a child to share. The Norpro 6840 consists of two parts: a plastic outer shell and a metal inner container. There’s a lid that comes with a handle and a dasher. 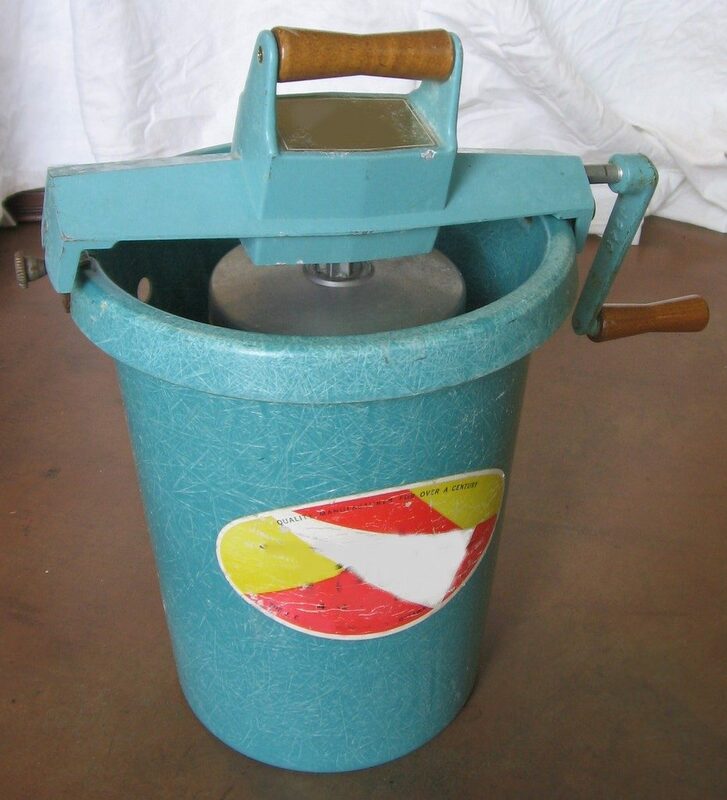 You pour chilled custard into the metal container, put the lid on, and crank until the ice cream has expanded significantly and is firm enough to enjoy. Unlike larger models, this hand crank ice cream freezer doesn’t need ice or rock salt. Instead, you simply throw the base in the freezer for a few hours before you start. This essentially serves the same purpose: since the base gets nice and cold, it chills the custard until it begins to form ice crystals. This approach only works because of the small size of the unit. 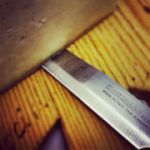 If it was much larger, you’d probably need to add ice throughout the cranking process in order to keep things adequately cool. As far as build quality goes, the Norpro 6840 leaves something to be desired, at least when it’s compared to the burly Immergood below. It’s something in between a children’s toy and a kitchen tool, and the way that it tries to fit both roles at the same time hurts it somewhat. It will probably last a good while, but it will almost certainly fail eventually. This isn’t going to be a thing that you hand down to future generations for sure. While the small size and cheaper parts make this ice cream maker less ideal for serious families, it’s perfect for anyone who wants to try out cranking their own ice cream at home without spending a fortune. It’s cheap, it’s small enough to pass around at the table, and the ice cream it makes tastes just as good as the stuff you make in the Immergood. I would recommend seriously considering this machine if you’re looking for something that you want to use with kids and you don’t have lots of experience making hand cranked ice cream already. If you decide you love it, you can always upgrade to a bigger machine later. The 6-quart premium Immergood Hand Crank Ice Cream Maker is an amazing choice for families that are more serious about hand cranked ice cream. Unlike the cheaper Norpro, this machine is made from stainless steel and will last for generations. It’s got durable gearing that won’t slip, rugged parts that can withstand the frenetic churning of a rabid seven year old, and plenty of insulation to help keep the cold where you want it. It’s expensive, sure, but this is the machine that you’ll want to have when your kids’ kids come to visit during the holidays. It’ll still work great. There are a handful of important things to discuss about this Immergood, but the most important factor here is the build quality. Decent hand crank ice cream makers are expensive. While there are some competing brands, none of them come anywhere near Immergood when it comes to the quality of the product itself. Many competing units are plagued by poor manufacturing tolerances and suffer from gear slippage, leaks, or worse, an outright failure to crank. Immergood, on the other hand, seems to take its products seriously and does a commendable job of delivering reliable, high-quality ice cream makers to its customers. Even when competing models don’t have major build problems, they’ll often have cheaper gearing that’s prone to jamming up when your custard starts getting thick. The Immergood has well-engineered quality parts that help transfer the force of your cranking to the custard smoothly and powerfully. This means that you’ll very rarely (if ever) have to crank backwards to try to clear a jam. 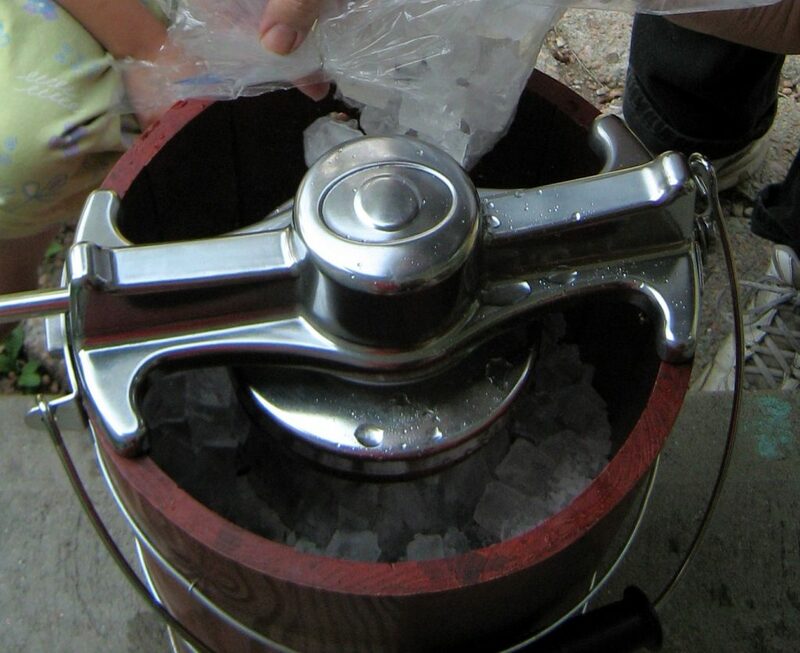 If you’re looking for an Amish hand crank ice cream maker, this is the one to go for. Some of Immergood’s best customers come from Amish communities where freezers aren’t common. Since this machine can make ice cream with just custard, ice, salt, and a bit of water, it’s a perfect choice. I mentioned earlier that this Immergood 6 quart ice cream maker is a bit pricey. If you haven’t looked at the price yet, you might be in for a bit of a shock. This high number is the result of a number of factors, but the most important reason for this machine to be expensive is the same reason why it’s so valuable. It’s very, very durable. You’re essentially buying a permanent kitchen tool that you can take with you when you move. It’s made carefully from solid stainless steel, which is both more durable and more expensive than cheap plastic. It’ll stay solid and leak-free for a very long time. Unlike the Norpro above, this ice cream maker uses a more traditional approach of having an insulated well in between the metal container in the middle and the outer walls. You put ice and rock salt into this well in order to chill the custard within your ice cream machine. The salt helps melt the ice faster, forming a slurry that conducts more cold to the metal container inside, and also allows the water in the slurry to get colder before it freezes. This bit of simple and traditional kitchen wisdom effectively chills the custard without the need for a power supply or motor. The sheer size of this 6-quart machine means that you’ll often have to add more ice as you churn. This isn’t a big deal – you simply pour in some more cubes and a bit of salt and churn some more! You can even vary the proportion of salt to ice to raise or lower the temperature of your custard by a few degrees. If it’s freezing too fast, simply add ice without salt. If it’s freezing too slow, add some extra rock salt (being careful to keep it towards the edges) in order to lower the temperature of your slurry. There’s not much to say about the taste of the homemade ice cream that you can produce with this device. That’s because it will probably be sublime. Making your own ice cream allows you to use the finest quality local ingredients and customize the recipe to your liking. You won’t save money here. Instead, you’ll be able to enjoy rich, creamy ice cream that’s totally free of the preservatives, colorants, or chemicals that find their way into the supermarket stuff. 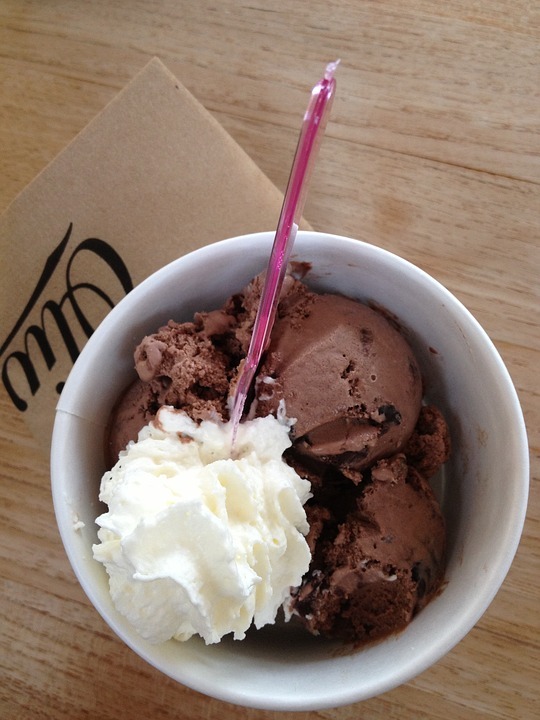 Immergood’s ice cream makers in all sizes have been fantastically well received by modern customers. This premium 6 quart machine strikes a great balance between size, price, and quality. The extra insulation on the premium model makes it a bit more comfortable to use for a fairly small added price. Be sure to check out the other models if you’d like something bigger or smaller. Overall, I think that the Immergood Premium 6-quart Ice Cream Maker is an amazing product. In my opinion, it’s the best choice for any family that plans to make moderate quantities of ice cream more than a few times a year. Even if you only break out this machine during the holidays, you’ll have lots of fun cranking delicious hand-made ice cream with your family. The memories you make will be priceless. I think this 4-quart Nostalgia machine is probably the best wooden ice cream maker for most families. It’s cheaper than the Immergood, it’s quite stylish, and it can make ice cream with a lot less work on your part. There’s one catch – it’s got an electric motor, not a hand crank. While this might offend purists, it’s definitely a superior product in any family where spinning a crank for half an hour is viewed as work, not fun. While this electric ice cream maker uses a wall socket to drive a motor, it operates pretty similarly to the Immergood unit I recommend for people who want to crank. 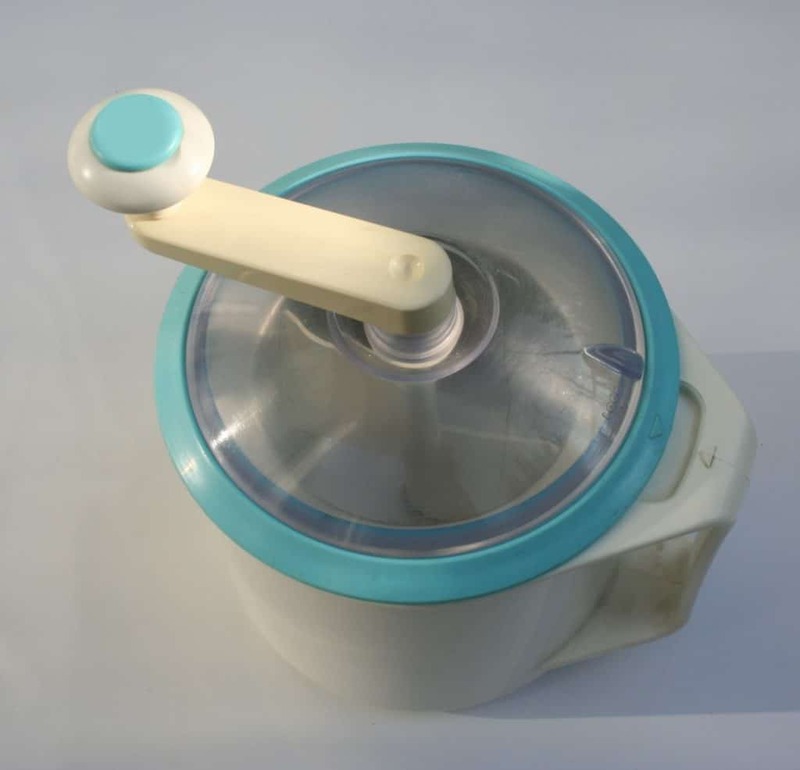 It’s got a metal internal container, an outer container that you fill with salt and ice, and a lid that’s attached to a dasher that spins and churns your ice cream. The big difference is how the dasher is turned. In the Immergood, you turn it yourself with a hand crank. In this unit, an electric motor that’s built into the lid turns the dasher. 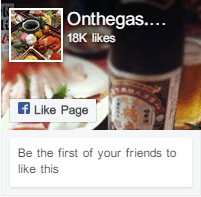 In terms of quality, this leads to a very minor and almost imperceptible difference. Ice cream experts tend to think that ice cream should be churned slowly at the beginning of the process and quickly at the end. The cheap electric motor in this wooden ice cream machine does the opposite. At the beginning, when the custard is thin, it spins quickly. As the custard gets thicker, it starts to slow down. Again, this does not ruin the ice cream. It makes it very, very slightly worse. It is, however, a minor downside. The major downside to this Nostalgia machine is not the fact that its ice cream is perhaps 98% as good as the Immergood’s. Instead, the fatal flaw here is the build quality. This 4 quart machine is a small fraction of the price of a durable hand crank model for good reason. It’s cheap. You’ll probably get a good amount of use out of this machine, but you’ll also wind up replacing it in a few years. The low price makes this somewhat palatable, at least in my opinion. If you’d like a machine that looks traditional while still doing the work for you, this wooden electric ice cream maker is probably the right choice. It’s cheap, it makes darn good ice cream, and it’s reliable enough to last a few summers. All of the ice cream makers above come with detailed instructions and recipes in the box. In order to get the most out of your ice cream, however, I’d recommend that you do two things that the instructions often skip. Not to your custard, of course. Instead, add a bit of water (regular old room temperature tap water is fine) to the ice and salt you use to pack around your center container. This is an old engineering trick that takes advantage of the fact that water conducts heat better than air. Normally, there are air pockets in between the ice cubes and the metal in the middle. While there’s usually some direct contact, there’s really not a lot. Adding water fills in these gaps and gives the cold a medium to travel through. This trick also works for chilling champagne or even beers in a cooler. Seriously, don’t skimp. The ice cream you make with your machine will taste as good as the things that you put into it. Homemade ice cream has something like three ingredients (cream, sugar, eggs) before your flavorings. Make sure you get good cream and good eggs. When it comes to flavorings, use fresh fruit, quality vanilla, and real chocolate. It’ll make a big difference. These days, I think that Immergood makes the best hand crank ice cream makers. The Premium 6-quart machine offers a great blend of price, size, and convenience, but you should also check out their other models if you want something bigger or smaller. If you’re not sure that you’ll still be cranking ice cream in a couple years, the Norpro 6840 is a child-sized machine that you can use to try things out without spending a fortune. Finally, if you’d like a larger cheap machine or you want a more traditional wooden exterior, the Nostalgia 4-Quart Wood Ice Cream Maker is a brilliant choice. It’s not hand cranked, unfortunately, but it’s cheap enough that you can switch over in a few years if you decide you’d rather do the work yourself.